Does 0.4% chocolate ice cream and 99.6% vanilla not make vanilla? What Senator Warren does not get is that her ancestors did not pay the price of being American Indian in the last 200 + years at least. That is why it is bogus for her to claim that identity. Elizabeth Warren had her DNA tested by a scientist affiliated with Ancestry.com the analyst who did the actual work placed her unadmixed American Indian ancestor about eight generations back. That is 1/256th (0.390%) American Indian. It could be as much as 1/32nd (3.13%) or as little as 1/1024th (0.098%). To place that in context compare her to me. According to ancestry.com I am between 0% and 3% American Indian. Averaging out to about 1.5% (1/64). Reading the report on Warren’s DNA…doing a back of the envelope calculation… that is hundreds of standard deviations more… statistically a huge difference. I am no DNA expert just a humble theoretical astrophysicist but 0.4% while, apparently, statistically significant is not culturally significant. I have that ancestry come down from my great grandparents who made choices of who to marry, and how to raise their kids. They taught cultural values which are very influenced by American Indian culture. The acceptance I have from my family as a transwoman likely is part of that. That is why I am not going to claim a trace of viking could make me Norwegian. I pay a price for the honor of having that bit of admixture. In many ways it is like being an immigrant in a country that many of my ancestors lived in since time immemorial. Bearing enough resemblance to them to look different from the people here now has had consequences. Driven further and further west ahead of the “frontier” so they could live in peace. Never white enough or black enough to be white or black. Never Indian enough for a lot of Indian nations either, that too has to be said. Called half breeds and given land or the right to apply for land in any one of several "half breed reservations" (They really called them that officially) then being terminated from that right. Then put in boarding school for American Indians only to have the census taker first write down that all the Indians were white except that one part black one written in as Mulatto. (Then corrected latter to all being Indians). That ancestor named Frank who was sent to boarding school Kansas was a descendant of an escaped or emancipated slave of a Virginia family. It is from them that I get my blood connection to Pocahontas. He chose a wife who was also a very admixed Potawatomi who like his father was descended of a mixture of French fur traders and Potawatomi and other great lakes area Indians. Last but not least my grandfathers grandmother who named him Hontas. So that her descent in some part from Virginia tidewater area Indians would be remembered. 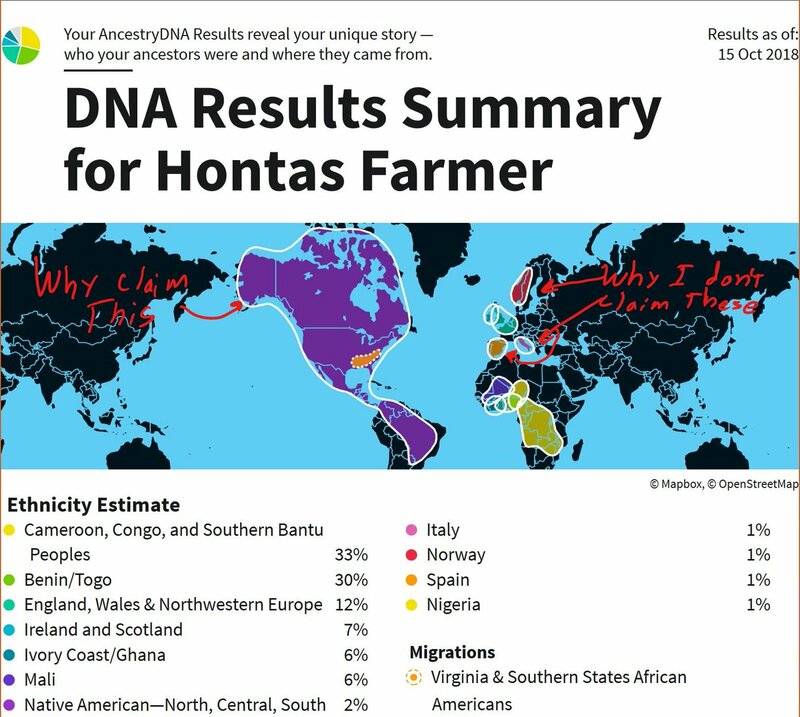 I can only guess based on her family being from Southhampton county at last record that they were Nottway a sometimes enemy of Pocahontas’s people. But, all had lost their language by that point. Even the barely white passing, slave owning ancestors may have had something to fear if attitudes changed. This lady is not an ancestor of mine. However, Matoaka Whittle Sims gives an example of just how American Indian someone of those particular Virginia blood lines could look even as late as the 1860’s. Yes she was regarded as white. With that name and that face there would've been places out west where someone like her would've faced discrimination. The Price Paid By The Reservation Indian. Full blooded or nearly full blooded reservation living American Indians have paid a HUGE PRICE for being who they are. There are reservations in this country which have third world conditions. No electricity, no running water or sewer. Poor education poor diet, and few economic prospects outside gaming, or mining, or similar. Not all are that way. Too many are. I would not dishonor their ancestors by claiming that what mine went through was anything like theirs. In the meanwhile … though I understand they were poor. Senator Warren’s ancestors were for all the world just white people. This does not mean things were easy. “White privilege” does not mean getting money or being “rich” or being helped in any way. It is not the same as racism. The term is overused to the point of being almost meaningless. However what Senator Warren did today was provide a prime example of white privilege. Being able to be a tiny TINY bit of something other than white and claim to be that thing. To claim to be such a small part Native as I am is to try and remember all those here in 1492 and before. To keep their memory and a bit of their culture alive. To claim it when one is such a small part as Senator Warren … I might as well claim to be a Viking or a descendant of Julius Cesar.